Recently, Kaspersky leased their latest antivirus software which is Kaspersky 2012!. This new version contains both Kaspersky Anti-virus and Kaspersky Internet Security applications. Whether you’re working online or offline, at home or any where you’ll experience unbeatable protection with Kaspersky’s innovative hybrid approach to digital security. Kaspersky combined real-time protection information from the cloud with powerful security technologies installed on your PC to deliver a faster. In this article, I am going to show you how to use this Kaspersky new software completely free by extending the trial period after 30days trial period. I choose Kaspersky Internet Security 2012 for this step by step guidance. 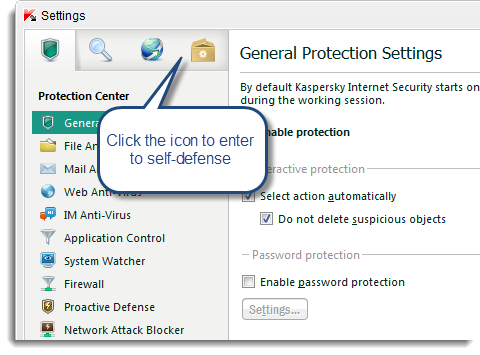 When resetting the trial period at the beginning, you need to disable self-defense feature in Kaspersky. 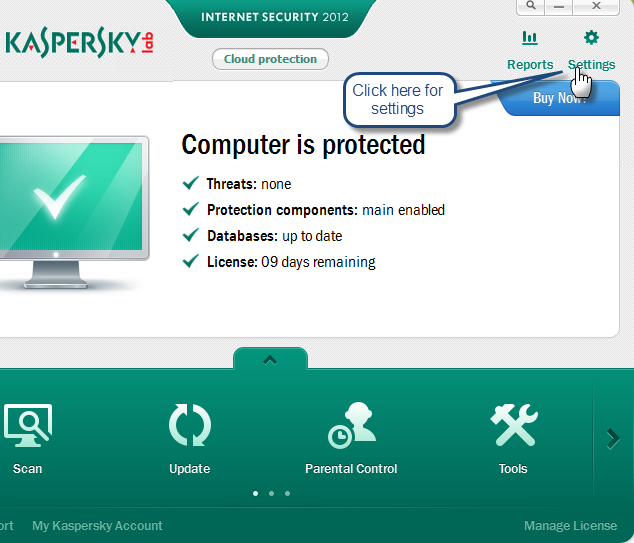 Therefore, open the Kaspersky application and Click on the settings in the right hand side. Get Kaspersky Trial Reset from below links. Click on the box icon as shown in figure below to enter to Self-defense option. 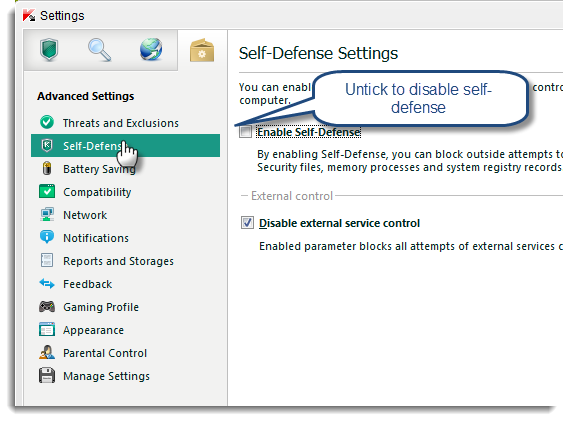 Now, click on the self-defense and untick the Enable Self-defense option and after click OK to apply. 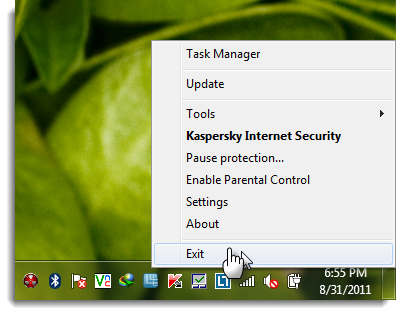 Here you need to exit from the Kaspersky application to run the trial reset program so that right click on the Kaspersky icon on the task bar and select Exit. 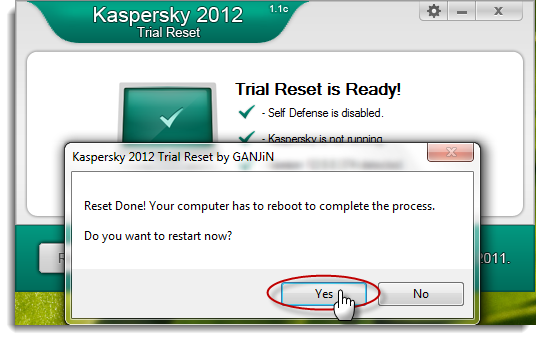 Download the Kaspersky Trial Reset program from the above link and then extract the archive into a folder. Run the KTR2012-v1.1c.exe file then it will pop up window and click on the restart button in that window. After restarting the PC, open kaspersky application. Hence, it will prompt to activate the application. 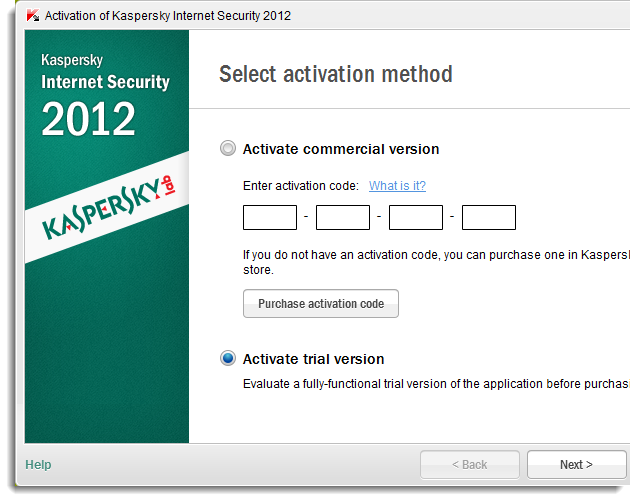 There you should select Activate trial version option and click Next to run the online activation process. Now, you have the 30 days trial Kaspersky Internet Security again. Please remember to put your comments below for this article. advіce in this рaгtiсulaг post! Greetings from California! I'm bored at work so I decided to browse your blog on my iphone during lunch break. I love the info you present here and can't wait to take a look when I get home. I'm surprised at how quick your blog loaded on my mobile .. I'm not even using WIFI, just 3G . We're a group of volunteers and opening a brand new scheme in our community. Your web site offered us with helpful information to work on. You have performed an impressive job and our whole neighborhood shall be thankful to you.